June 5 is the 156th day of the year(157th in leap years) in the Gregorian calendar.There are 209 days remaining until the end of the year. 1851 – Harriet Beecher Stowe's anti-slavery serial, Uncle Tom's Cabin , or Life Among the Lowly, starts a ten-month run in the National Era abolitionist newspaper. 1956 – Elvis Presley introduces his new single, "Hound Dog", on The Milton Berle Show , scandalizing the audience with his suggestive hip movements. The Lord Warden of the Cinque Ports is a ceremonial official in the United Kingdom. The post dates from at least the 12th century, when the title was Keeper of the Coast, but may be older. The Lord Warden was originally in charge of the Cinque Ports, a group of five port towns on the southeast coast of England that were formed to collectively supply ships for The Crown in the absence at the time of a formal navy. Today the role is a sinecure and an honorary title, and 14 towns belong to the Cinque Ports confederation. The title is one of the higher honours bestowed by the Sovereign; it has often been held by members of the Royal Family or Prime Ministers, especially those who have been influential in defending Britain at times of war. Year 301 (CCCI) was a common year starting on Wednesday of the Julian calendar. 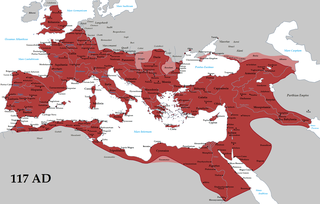 At the time, it was known as the Year of the Consulship of Postumius and Nepotianus. The denomination 301 for this year has been used since the early medieval period, when the Anno Domini calendar era became the prevalent method in Europe for naming years. Sima Lun, courtesy name Ziyi (子彛), was titled the Prince of Zhao and the usurper of the Jin Dynasty from February 3 to May 30, 301. He is usually not counted in the list of Jin emperors due to his brief reign, and was often mentioned by historians as an example of a wicked usurper. He was the third of the eight princes commonly associated with the War of the Eight Princes. Blessed Meinwerk was the Bishop of Paderborn from 1009 until his death. 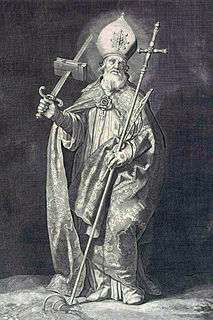 Saint Boniface, born Winfrid in the Devon town of Crediton, England, was a leading figure in the Anglo-Saxon mission to the Germanic parts of the Frankish Empire during the 8th century. He organised significant foundations of the Catholic Church in Germany and was made archbishop of Mainz by Pope Gregory III. He was martyred in Frisia in 754, along with 52 others, and his remains were returned to Fulda, where they rest in a sarcophagus which became a site of pilgrimage. Boniface's life and death as well as his work became widely known, there being a wealth of material available—a number of vitae, especially the near-contemporary Vita Bonifatii auctore Willibaldi, legal documents, possibly some sermons, and above all his correspondence. He became the patron saint of Germania, known as the "Apostle of the Germans". Saint Dorotheus bishop of Tyre is traditionally credited with an Acts of the Seventy Apostles, who were sent out according to the Gospel of Luke 10:1. ↑ "MORE THAN 100 DIED IN VOLGA BOAT CRASH, SOVIET OFFICIAL SAYS". The New York Times. 1983-06-08. Retrieved 2018-11-29. ↑ William K. Stevens (June 1984). "PUNJAB RAID: UNANSWERED QUESTIONS". New York Times. Retrieved 4 June 2018. ↑ "Kate Spade: Fashion designer found dead in New York home". BBC News. June 5, 2018. Retrieved June 5, 2018. Wikimedia Commons has media related to June 5 .